Ukrainian President Petro Poroshenko has ordered security forces to disarm all illegal armed groups in the country, following a deadly gunfight involving the Right Sector ultranationalists and the police in the town of Mukachevo. “No political force should have armed cells and no political force will have one,” Poroshenko said during a meeting of Ukraine’s National Security and Defense Council (NSDC). 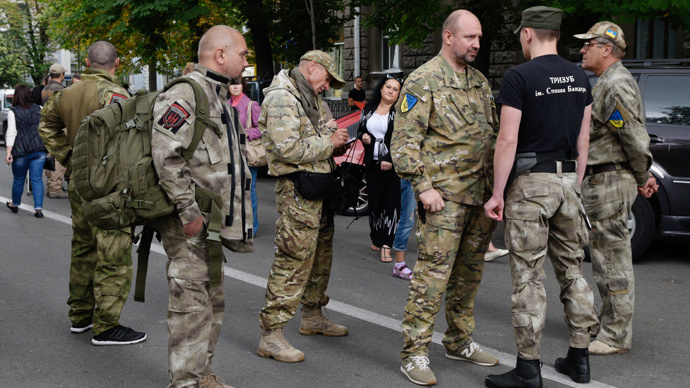 According to the president, the appearance of heavily armed men in Mukachevo, “a thousand kilometers away from the front line,” is an attempt to destabilize the situation in Ukraine. “The authorities will not allow this,” he promised, tasking the Interior Ministry and Ukraine’s Security Service (SBU) with disarming the illegal armed groups. 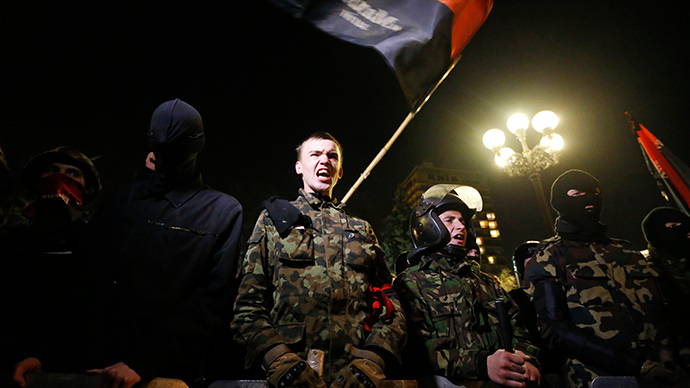 However, Right Sector spokesman Artem Skoropadsky, said that president’s order doesn’t apply to the ultranationalist group. “The statement by Petro Poroshenko is addressed to illegal armed groups. We are not an illegal armed group. Illegal armed groups are bandits, and we are volunteer Ukrainian corps Ukrainian, which protects the independence and territorial integrity of Ukraine. Therefore, this statement does not apply to us," Skoropadsky told the RIA Novosti news agency. On Monday, Right Sector hacked the Twitter account of Ukraine’s National Security and Defense Council (NSDC) as tensions kept mounting between the ultranationalist movement and the Kiev authorities. 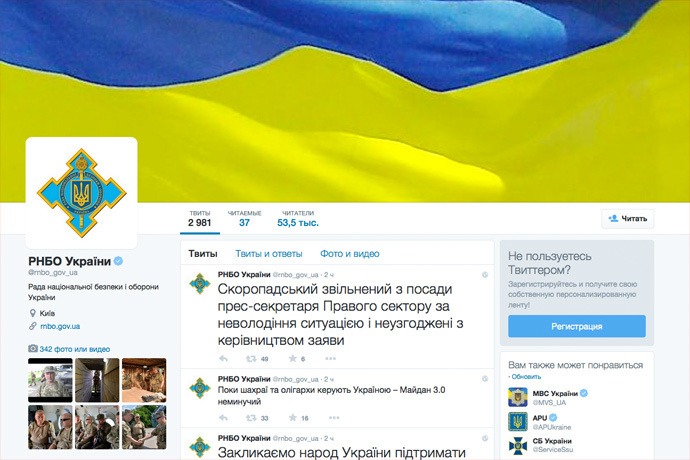 “The NSDC Twitter account is under Right Sector’s control,” the tweet, announcing the hack, said. A series of messages that followed was dedicated to the events in the western Ukrainian town of Mukachevo, where a group of Right Sector militants are in a standoff with security forces after a deadly shootout with the police on Saturday. NSDC is a Ukrainian state agency tasked with developing national security policies on domestic and international issue and advising the Ukrainian president. The hackers also demanded the resignation of Ukraine’s Interior Minister Arsen Avakov and Major-General Andrey Taran, chief of the Joint Centre for Ceasefire Control and Coordination in eastern Ukraine. They said: “Taran provides cover for smuggling in the area of the antiterrorist operation.” This is in eastern Ukraine where Kiev has been fighting the rebels for over a year. The struggle for control over smuggling routes in the Carpathian Mountains between Right Sector members and local MP Mikhail Lanyo is said to be the reason for the shootout in Mukachevo. Another tweet on the hacked NSDC account warned that “while crooks and oligarchs remain in control in Ukraine – Maidan 3.0 is unavoidable.” They are referring to the Maidan protests in late 2013 and early 2014, in which the Right Sector helped oust President Viktor Yanukovich. According to the Ukrainian authorities, two Right Sector fighters and one civilian were killed and 10 people were injured, including five law enforcement officers, in a gun fight. The skirmish saw AK-47s, heavy machineguns mounted on SUVs and grenade launchers being used. Two dozen heavily armed ultranationalists took shelter in the woods on the outskirts of Mukachevo and have so far refused to lay down their arms. Two Right Sectors troops surrendered to the authorities on Sunday after sustaining serious injuries. Two more radicals managed to break out of the encirclement on Monday by using a child as a human shield. “Police and security forces of Ukraine tried to detain them, but they grabbed a six-year-old and fled using him as a human shield. The men later released the child,” the press service of the Interior Ministry said, as cited by TASS. On Sunday, Right Sector activists were holding rallies in 17 cities across Ukraine, including Kiev, Dnepropetrovsk, Odessa, Zaporozhye, Ternopol, Mariupol, Kherson, Kramatorsk, Poltava, in support of the radical brigade blocked near Makuchevo. The radical movement announced the protest in Kiev will be indefinite, saying the action will be reinforced by troops currently fighting the militias of the People’s Republics of Donetsk (DNR) and Lugansk (LNR). Over 100 activists and Right Sector members wearing mask and balaclavas kept up their protest outside the Presidential Administration in Kiev on Monday. The demonstration went on without incident, as no clashes between the Right Sector supporters and the police guarding the building were reported. On Saturday, Right Sector spokesman, Artem Skoropadsky, said the group has two battalions in the conflict zone and “have 18 or 19 reserve battalions spread across Ukraine. “We can send all reserve battalions to the president’s administration and to the Ministry of Internal Affairs,” Skoropadsky threatened, adding that all units are ready to act if the Ukrainian authorities decide to seek armed confrontation with the radical nationalists. 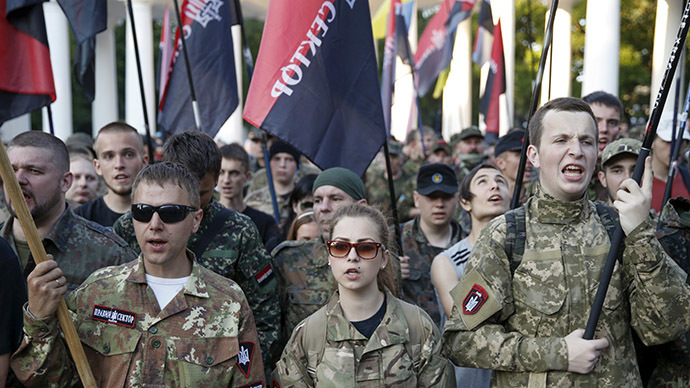 Another Right Sector spokesman, Andrey Sharaskin, told Ukraine’s 112 channel that “over 10,000 activists have been mobilized all across Ukraine” due to tensions with the authorities. Reports emerged that the Ukrainian authorities were deploying additional units near Right Sector training camps and bases, in order to block them if the nationalists carry out their threats and try to deploy forces elsewhere in the country. There are reports that Slovakia and Hungary are tightening security at their borders with Ukraine because of the Mukachevo events. With the ongoing fighting and humanitarian crisis in the country, it’s logical that bordering nations are “very concerned by the number of people coming…from Ukraine and the destabilizing effect,” he said. “What we’ve got is a big problem called Ukraine in Europe, which is causing overspill. So the rhetoric in the EU is very supportive of Kiev at the same time Kiev is causing it an awful lot of problems,” Clark stressed.